on Friday, August 16, 2013 at 11 a.m. The public is invited to the opening of the 33-unit addition to Dahlia Court 1 located at 1300 Dahlia Court. The ceremony will recognize donors and financing partners of the affordable housing project. A light lunch and tours will follow. Reservations are required by calling (805) 699-7220 or email sboffice@pshhc.org. Capital campaign major donors will be recognized including All Saints by-the-Sea Episcopal Church, City of Carpinteria, Ted and Julie Chandler, Looker Foundation, Outhwaite Family Foundation, Michael & Jennifer Payne, Santa Barbara Foundation, Weingart Foundation, and James Wheeler. Financing partners include the California Community Reinvestment Corporation, Calif. Tax Credit Allocation Committee, City of Carpinteria, County of Santa Barbara, Housing Authority of the County of Santa Barbara, Federal Home Loan Bank of San Francisco, Merritt Community Capital Corporation, Rabobank, and Montecito Bank & Trust. The new buildings are comprised of 14 three-bedroom and 19 two-bedroom apartments and also include a large multi-use community room, youth learning center, offices, laundry facilities, and clinic rooms. Peoples' Self-Help Housing provides affordable housing and programs leading to self-sufficiency for low-income families, seniors, and other special needs groups on California's Central Coast. PSHH has developed and now manages over 1,500 affordable rental units in Santa Barbara, San Luis Obispo, and Ventura counties. It has also provided first-time homeownership opportunities for 1,150 working families. 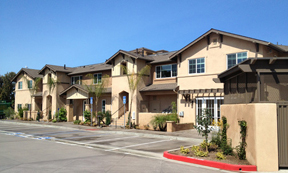 PSHH is the leading affordable housing developer on the Central Coast with offices in Santa Barbara and San Luis Obispo. Friday, August 16, 2013 at 11 a.m.